Britain’s got a new polymer £5 note – but is it a UK first? On 13 September, the Bank of England will issue a new £5. It will be the first-ever polymer (or “plastic”) banknote that they have issued. But is it the UK’s first? The new Bank of England £5 Polymer note enters circulation on 13 September. Well it is certainly not the first polymer banknote issued in the UK. Last year Clydesdale Bank issued Scotland’s first polymer banknote to mark the 125th Anniversary of the Forth Roadbridge. But it was Northern Ireland that beat everyone else to it with a commemorative polymer banknote in 1999 issued to mark the millennium. So this might surprise you. No Scottish or Northern Irish banknotes are legal tender. Bank of England banknotes are – but only in England and Wales. But don’t panic – if you live in Scotland or Northern Ireland – your money’s not worthless! Legal tender does not mean quite what you think. It has a very narrow technical definition which relates to your ability to pay a debt into a court. In fact all Scottish and Northern Irish notes are considered “legal currency” across the whole of the UK. But that does not mean that they have to be accepted and it’s not unusual for English or Welsh shop owners to be reluctant to accept non-Bank of England notes. The Northern Irish and Scottish polymer banknotes clearly beat the new fiver. But they were special commemorative issues with limited circulation and little recognition outside of their issuing nation. The new polymer £5 note is certainly the first “legal tender” note issued in the UK but that’s not as important as it first seems. It is, however, the first polymer banknote issued for ongoing circulation (rather than as a commemorative issue) which is generally accepted across the whole of the United Kingdom. 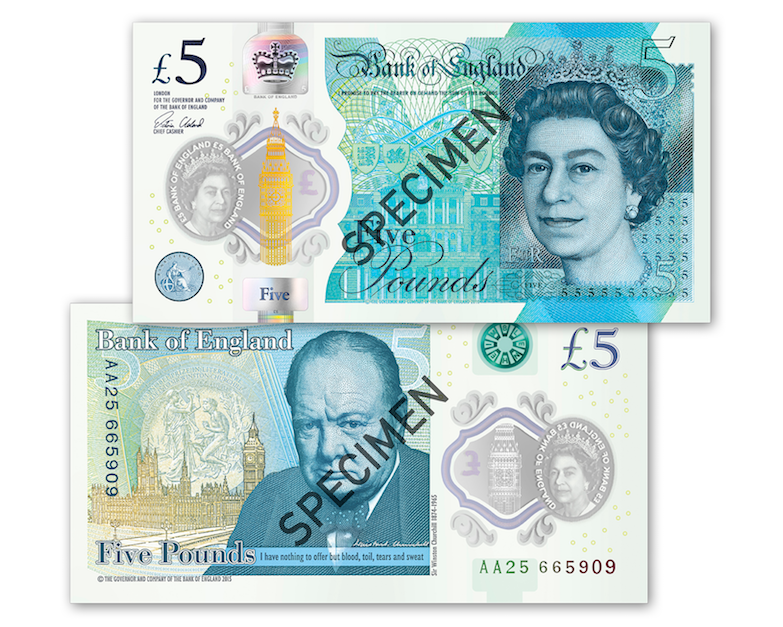 Just 5,000 new UK Polymer £5 Notes have been reserved for a Limited Edition DateStamp™ release. This is the VERY FIRST time that a DateStamp™ banknote has been released. Click here to add one to your collection. Hi Mary, sorry about that – we may well have sold out quickly as that’s a really popular collector’s item. We do have a fine silver version of the note still available if you’re interested: http://www.westminstercollection.com/p-743C/The-White-Fiver-Fine-Silver-Banknote.aspx Thanks, Robin. Also if you have certain amounts of notes with the serial no. consecutive to each other also seem to be selling very well. We’re glad you like the blog! We don’t unfortunately do guest posts on our website at the moment I’m afraid. We hope you continue to enjoy our blog!